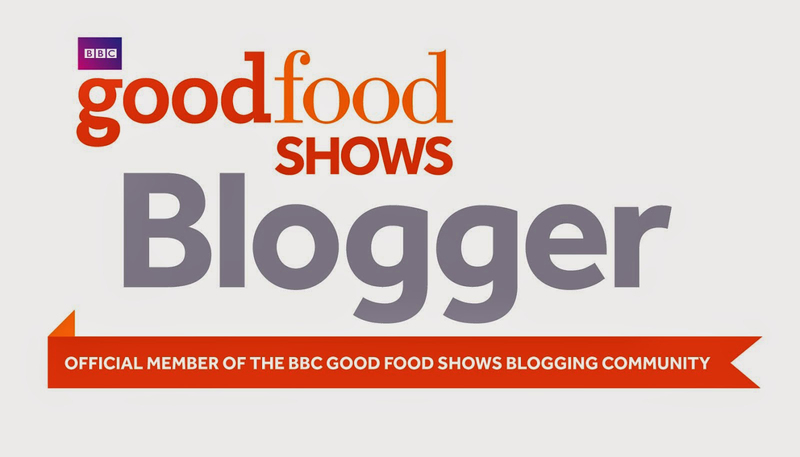 I have to admit, I’m a fan of Jamie Oliver. His 15 minute meals and money-saving cook books are well used in my house and I believe he is one of the few chefs out there genuinely trying to help people eat and live better. The meals from his cook books are usually simple but delicious and packed with flavour and I was hoping from something similar from Jamie’s Italian York. 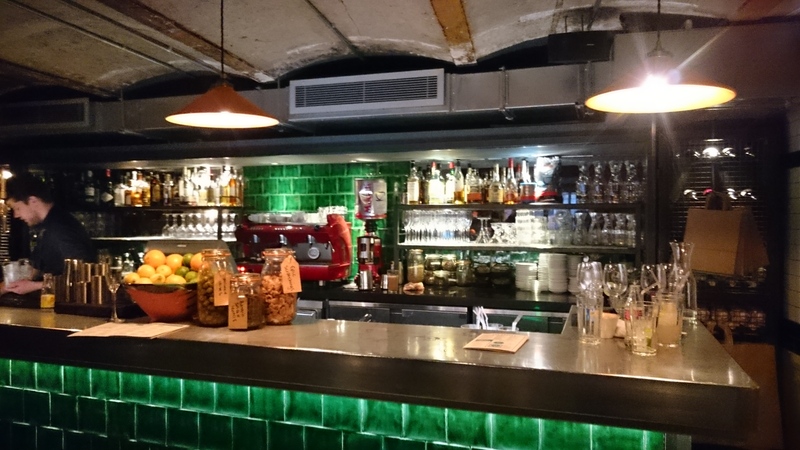 When you first step into Jamie’s Italian you’re surprised that such a space exists hidden away back there! There’s a cute little courtyard that I imagine is a lovely place to sit in Summer with a cocktail or bowl of pasta. On a Saturday night the pub next door seems to gets quite lively as people spill out onto the courtyard for a smoke, but I imagine most days this isn’t really an issue. 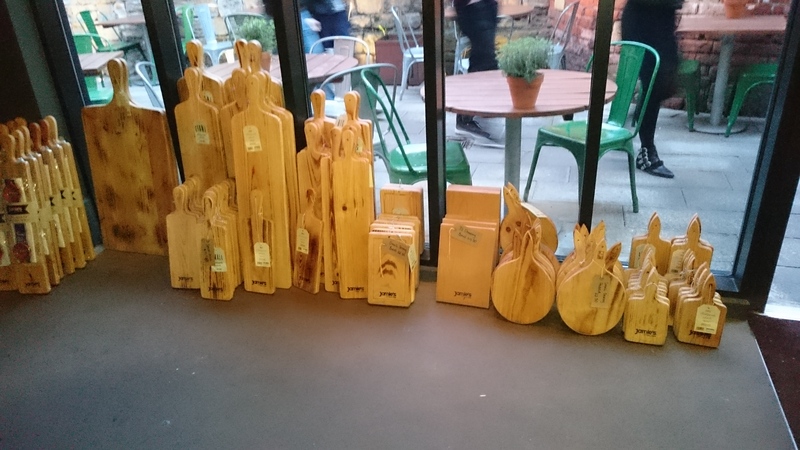 Can you ever have too many planks? As you enter the door, shelves of gift sets, terracotta bowls and planks line the walls. I’d love to say that I didn’t buy in to all this extra commercialism but I’m a sucker for a good serving platter and am the proud owner of a huge Jamie plank! These displays and the impressive bar area give you something to do as you wait for your table – something that seems a little inevitable in their busier times. Luckily, the bar snacks and choice of cocktails don’t make a short wait an unappealing prospect.The bar’s staples are refreshing and elegant pre-dinner drinks – the gin bramble and elderflower vodka cocktails amongst my favourites. The space upstairs is expansive but separated into a lot of smaller rooms which means that there’s a nice cosy feeling maintained at the tables. The atmosphere is quite loud and frenetic on a Saturday night but that seems in keeping with the Italian vibe. The restaurant is beautiful with bare brick walls, red leather chairs and wood beams. Decoration is limited to a few flourishes – some interesting lighting fittings and wall art – but the rest of the space is given to simply showcasing the ingredients used. Jars of olives and pulses fill the window ledge, garlands of garlic hang from the beams whilst dried Italian ham sits proudly against the counter. There’s also a cute little ‘bread station’ where you can see the full variety available in their starters and bread plates. Jamie’s menu is a nice mix of pasta, fun sides and hearty meat courses. It would have been nice to see a few more fish choices on the menu although it seems like they keep the fish as a ‘daily special’ offering, I imagine so they can ensure they are only offering the freshest catch available to them each day. We started with one of the popular planks which, as a nice touch, came balanced on two cans of Italian (of course!) tomatoes. The man who waited on us really seemed to know his stuff and talked us through the cured meat plank we had chosen – Fennel salami, pistachio mortadella, prosciutto and schiacciata picante all served on a plank loaded with mini buffalo mozzarella, pecorino & chilli jam, a selection of pickles, olives and crunchy kale slaw. 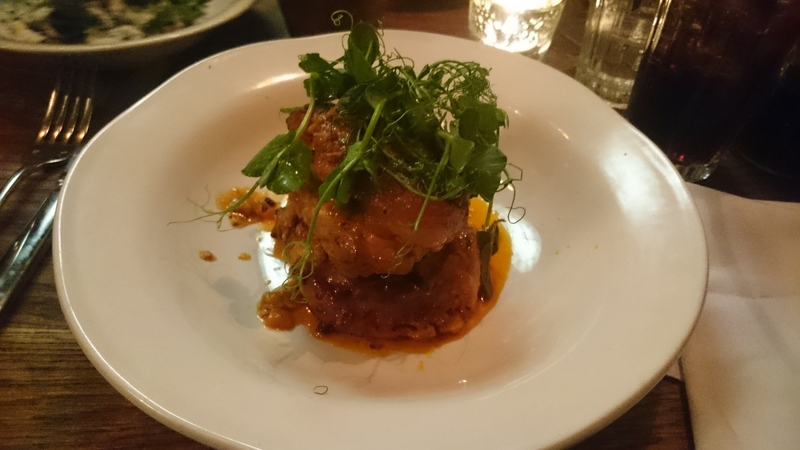 It made the perfect starter as it was packed full of different flavours but not too filling. Next up, we both decided to try some slow cooked meat. 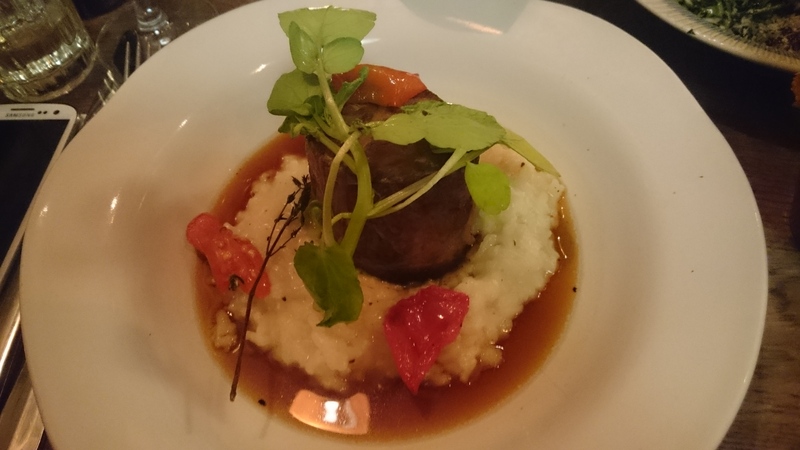 Osso Buco – free-range pork, slow-cooked with saffron, onion, tomatoes & Trebbiano white wine, served with Sicilian-style orange gremolata, and Shin of Beef served on a cheesy risotto with tomatoes and broth. Fully dedicated to getting a full appreciation of what Jamie’s had to offer we also treated ourselves to 3 sides – garlic chips, rocket and parmesan salad, and cauliflower fritti with a spicy arrabbiata sauce. The beef shin was especially tender and was nicely moist with the broth that surrounded it. We also loved the cauliflower fritters which were really addictive – crunchy outside and moist inside with a good kick from the spicy sauce. 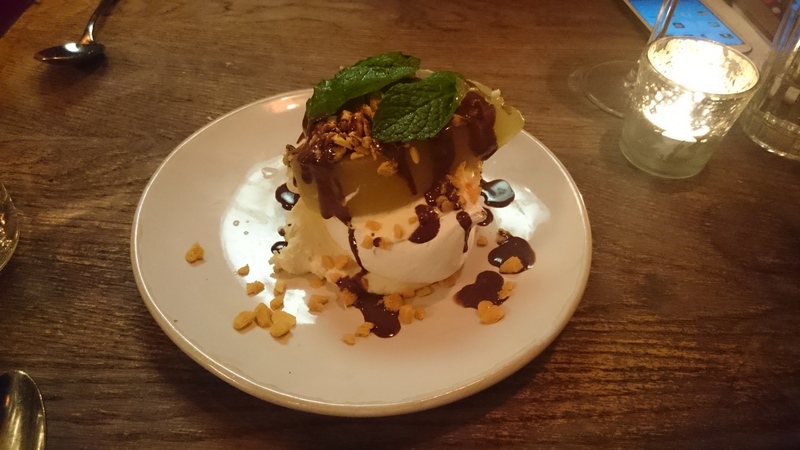 To end the meal, we had a couple of espresso and a chocolate, pear and honeycomb pavlova – light and fluffy meringue served with poached pears, whipped mascarpone, honeycomb and a drizzle of dark chocolate. I would have loved the pears to taste a little stronger and the chocolate to be a little darker but overall it was a nice end to the meal and a refreshing change from the more run of the mill deserts. 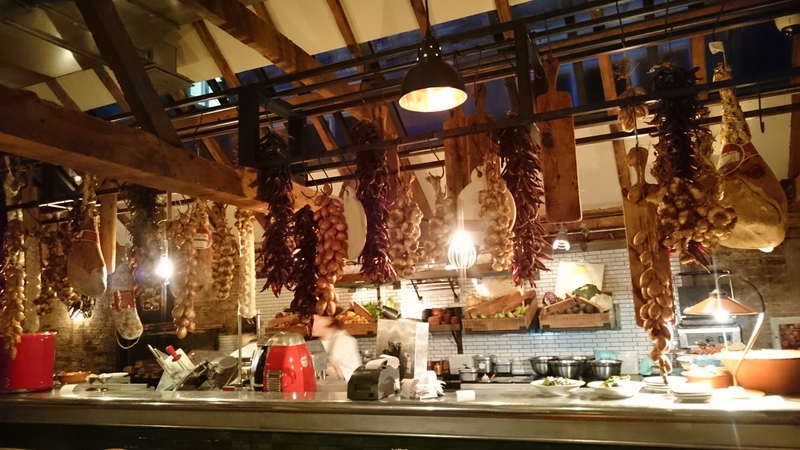 A nice thing about Jamie’s Italian restaurant is that it caters for every occasion – if you want a three course meal with a nice wine on a weekend they can do that but it’s also a great spot for a light lunch or more affordable midweek treat. The variety in the menu means that you can really choose how much you want to eat – and spend. 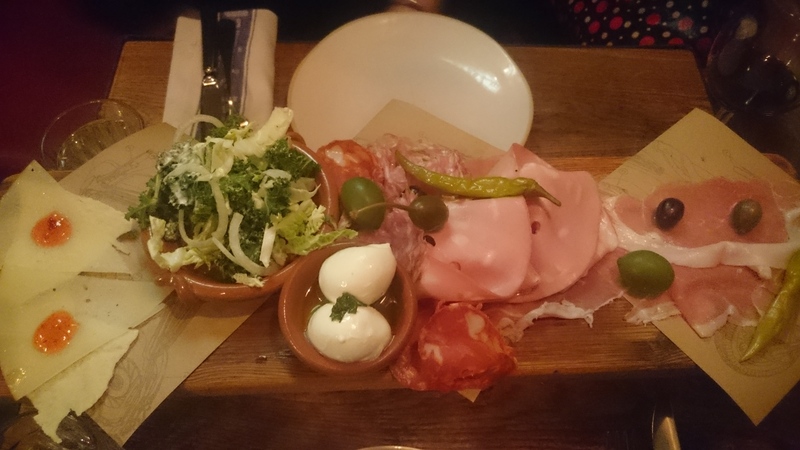 The Jamie’s Italian Gold Club is also a pretty nice scheme that treats you and your party to a free little taster every time you visit. 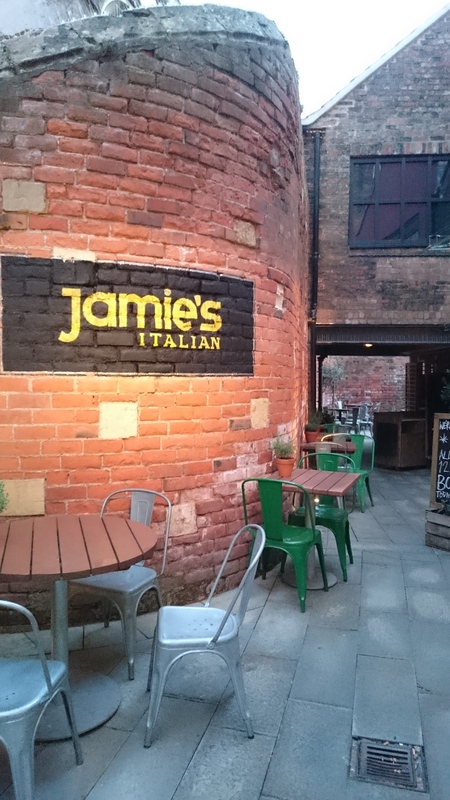 Jamie’s Italian is right in the centre of York at Lendal Cellars. They can cater for large groups and are open 12 noon – 11pm Mon-Sat and 12 noon – 10.30 pm Sun.